Spend an unforgettable hiking holiday on the Achensee lake! Thanks to our delicious Karwendel vitality breakfast you will be perfectly prepared for your hiking tour. Just put your rucksack on, tie the laces on your hiking boots and you are all set to take off and explore the hiking paradise on our doorstep. In the Rofan and Karwendel mountains you can hike as far as your legs will take you. The network of hiking trails stretches across 500 kilometres: an immense and breathtaking hiking paradise which has even been awarded the mountain trails seal of approval by the State of Tyrol. From gentle trails for enjoyable walks to Alpine summit tours ... all ability levels are well catered for here. If you want panoramic views without the effort of climbing to the top simply take a cable car, which takes you straight from Pertisau (952m above sea level) up 500m further to the Zwölferkopf summit. Inhale the mild air, get moving and admire the magical views. This is a perfect way to refuel on natural energy. How you choose to move is entirely up to you - either gently or more strenuously while hiking, climbing, Nordic walking or jogging (along around 200 km of signposted running trails) ... and if you need refreshing afterwards, why not take a dip in the Achensee? Rucksacks and hiking sticks are provided and will be waiting for you in your room (rental is free of charge). 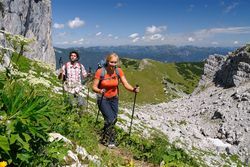 We can also provide you with hiking tips and can take you along our favourite routes on group hiking tours in the Karwendel mountains. Simply choose your favourite room for an unforgettable hiking holiday.